A Ukrainian translator allegedly gathered intelligence in Luhansk Region. The Russian Federal Security Service (FSB) reported on 18 July about the arrest in Russia and expulsion of a citizen of Ukraine, who has worked as a translator of the OSCE monitoring mission. He is accused of gathering intelligence for the benefit of the Ukrainian Security Service (SBU). "FSB Russia exposed an agent of the Security Service and detained a Ukrainian citizen on the territory of Russia, Artem Shestakov, who works as a translator for the special OSCE monitoring mission in Ukraine," the FSB press service said in a release. "According to Shestakov's confessions, in the summer of 2015, as a member of the OSCE Mission in Lugansk, he was Kyiv, where he was recruited by an SBU officer of the Department of Protection of National Statehood Serhiy Slipchenko,", - stated in the FSB. Shestakov have regularly visited the government bodies of the terrorist organization "DPR", the places of deployment of militant units. He has transferred the received information to the SBU over the internet. "In particular, he reported about movements of weaponry and personnel, the geographical coordinates of the places of deployment of the militia units, phone numbers of commanders etc," the FSB release reads. As the activities of Shestakov have not caused any damage to the security Russia, he "was allowed to return to the territory of Ukraine. However, the SBU informant will not be allowed back in." 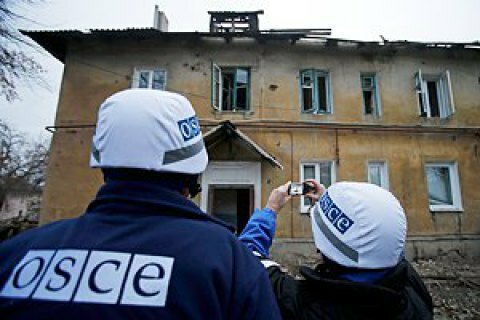 The OSCE mission to Ukraine has about 700 observers, most of whom are involved in the monitoring on the territory of Donetsk and Luhansk regions.